Many people ask "why floating sheep?" and there are answers (see link above: why floating sheep? ), but we thought it was time to finally admit the true origin of the name , rather than mumble something about digital data, materiality, and floating. 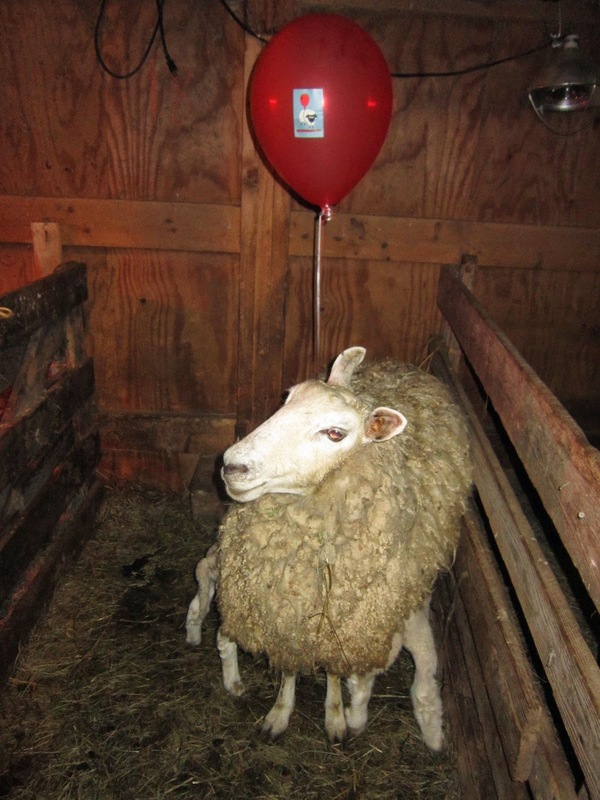 You see, sheep do indeed sometimes come attached to red balloons, as documented by Vermont-based geographers and sheep farmers Ethan Mitchell and Susannah McCandless. As shown, in the photographic evidence below, an apparent cultural practice of Vermont farmers is to attached red balloons to sheep suspected of demonic position by virtue of possessing six legs. Non-demonic sheep are expected to demonstrate their innocence by floating above the material plane. Sadly for this sheep, it remained stubbornly earthbound, despite the addition of sticker to the red balloon. But all is not lost as apparently the extra legs where due to a pair of quiet lambs, and there is absolutely nothing creepy about the silence of the lambs. 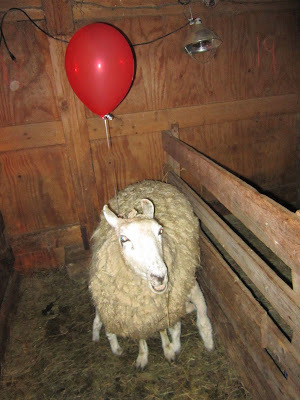 Or the curious examination of red balloons by a herd of sheep. Thanks for the photos Ethan and Susannah! This whole review of sheep, demons, balloons and silence naturally leads us to ponder questions about how material objects are influenced by the immaterial data on the web. For example, this booth sponsored by Oreo at SXSW that "created an algorithm" to determine what flavor of cream filling should be used in a 3D printing of Oreo cookies based on what is trending on twitter allowing one to "eat the tweet". Which brings up the obvious question of what a bieber or kardasian or twerking oreo would taste like. This leads into bigger questions about how digital words have material influence on the natural environment, e.g., Can Tweeting be used to a plant help it grow? This study aimed to find out if talking would encourage growth. Other studies have used twitter feeds to create music by assigning sounds to particular words from a subset of users, or the emotional content of tweets in entire regions. Of course, none of this really explains the why behind the name Floatingsheep. Suffice it to say that it was determined through the construction of a specially designed algorithm. Or simply add to the general fog and confusion about the name.